» The Roofnest Eagle Roof-Top Tent Review: Should You Buy It? Popularized in Australia, New Zealand, and across Africa in the 1950s and ‘60s, roof-top tenting is now making waves in North America after a rather tepid introduction in the immediate aftermath of the RTT’s antipodean debut. While a mere decade ago the options on the market for would-be RTT campers were few and none too fetching, these days a simply vast variety of RTTs available for those looking to elevate their camping experience from the grittier, down-in-the-dirt MO of traditional tent camping to something a little more generous and cordial in terms of convenience, comfort, and, in some cases, downright luxury. Among the most notable and attractive of those options are the offerings of Colorado-based brand Roofnest. In this article, we aim to introduce you to the Roofnest catalog with an in-depth review of the Roofnest Eagle Roof-Top Tent and a brief comparison with further Roofnest models, the Sparrow, Sparrow Eye, and the Sandpiper. Before we get down to our Roofnest Eagle review, however, let’s first take a look at some of the crucial factors to take into consideration when buying an RTT for your outdoor adventures. Why choose a rooftop tent? 1. Where are Roofnest RTTs made? 2. Do Roofnest tents come with a warranty? Those who choose a rooftop tent over a standard tent usually have very good, concrete reasons for doing so. We’ve listed these reasons—along with a few notable caveats—with a selection of the RTT’s pros and cons below. Convenience—While it’s all fine and well being hoisted up above the beasts and creepy crawlies to do your sleeping, when you need to nip out in the middle of the night to answer nature’s calls it’s not ideal to have to take on a V4 boulder problem (as the ladder on your RTT can appear circa 4 am with sleep-addled eyes and trail-wearied bones) on your vehicle in order to do so! There are two main types of roof-top tents out there (if, that is, we exclude the pop-top variety built into vehicles at the point of manufacturing): soft-sided, flip-open tents and hardshell tents. Generally speaking, softshell, flip-open varieties of RTT offer roomier interiors, take up less space on the roof of your vehicle and weight less than hardshells. On the downside, they take longer to set up and are much more exposed to precipitation and dirt. While typically smaller in terms of interior capacity and costing a bit more than softshell competitors, hardshell RTTS are usually much easier to set up, have superior aerodynamics, and offer your tent better protection while traveling between camping locations. The trouble with purchasing an RTT is the simple fact that they all look, frankly, just a little bit awesome. This being so, the temptation for many buyers unaware of the features and facets that make any one RTT better than the other is to opt for one of the first models they come across, basing their decision on appearances alone. As with all things in life, appearances can be deceiving, and with that in mind we have compiled a list of the attributes you should be looking for before hurrying to the checkout or clicking the ‘pay’ button. Although we’ll never need to carry the thing after first installing it on our vehicle, one of the most notable potential downsides to an RTT is its weight. With most models weighing in excess of a hundred pounds, having a roof rack and vehicle that are capable of supporting the RTT’s weight and the additional weight of those sleeping inside it should be your first pre-purchase consideration. Often, locating the weight capacity of your vehicle’s roof rack takes a bit of digging, but in most cases you can find it in the owner’s manual or by contacting the vehicle or rack manufacturer. How quick and easy it is to get your RTT “pitched” varies greatly from model to model, with some varieties falling into the sub-one-minute category for a lone camper and others requiring two pairs of hands and anything up to half an hour, depending on how well practiced you are in the setup process and whether or not weather conditions are on your side. A few general observations can be made with regard to how easy it is to set up varying types of RTT. For the most part, the most difficult to set up are flip-open, soft-sided tents with larger capacities and also those with taller peak heights, while “hardshell” models—which are typically less spacious—can be popped open and good to go in next to no time. As with any type of tent, roof-top tents generally come with a person rating (2-person, 3-person, etc.) supplied by the manufacturer. While this may help to give you a general idea of size when doing your initial research, it should not be relied upon as an accurate guide to how well any roof tent will be suited to you and your camping partners as manufacturers are often a touch on the optimistic side when according these ratings and, of course, the dimensions and spatial needs of one person can vary greatly from those of another. The best way to decide whether or not a car roof tent will provide adequate elbow room for your car-camping crew is to do a little research, hunting down the specific dimensions in the product listing and then calculating the tent’s square footage. This can be done by simply multiplying your tent’s width by its length, i.e. 6 feet wide by 7 feet long equals 42 square feet of floor space. As a ballpark guide, the amount of square footage required for full-grown adults is around 15 square feet per person, though this, naturally, will vary depending on your own dimensions and inclinations as regards personal space. In addition to overall square footage, it’s wise to check the tent’s width, length and peak height will be enough to accommodate its future sleepers—particularly if any of these happen to be particularly tall—and their sleeping gear. As with a standard tent, the overall performance of any RTT with regard to waterproofing, wind resistance, ventilation, ruggedness, and durability are important factors in determining its suitability and appeal compared to its competitors. While RTT manufacturers are generally less forthcoming with related specifications such as hydrostatic head ratings, it’s wise to check that any tent on your shortlist has a waterproof rainfly, high-denier fabrics, and enough ventilation points to increase airflow and reduce condensation inside the tent. 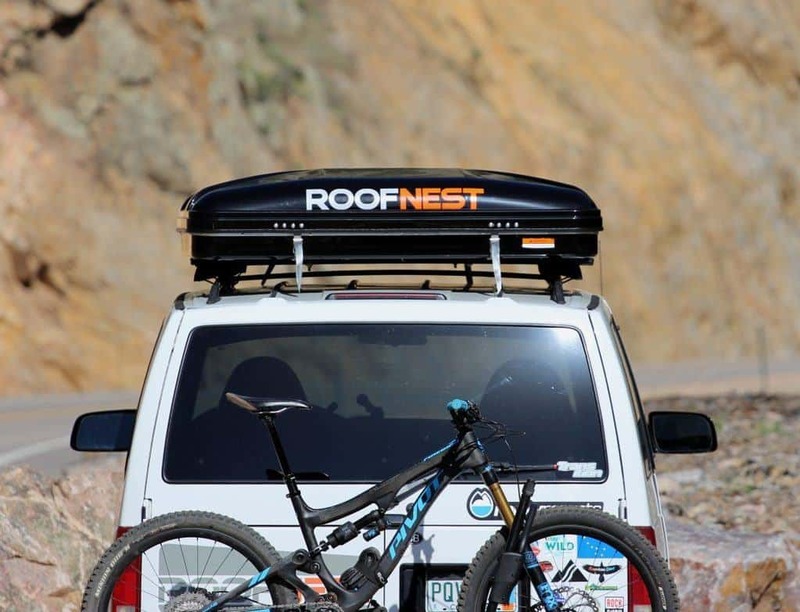 Most vehicle roof racks are rated to carry in excess of a 125-pound dynamic load, meaning that all but a few racks will be able to support the 140-pound weight of the Roofnest Eagle with room (or weight, rather) to spare. The static load capacity of every Roofnest tent is a whopping 650lbs, so unless you plan on flaunting the recommended occupancy capacity (2/3-person) and/or squeezing your collection of anvils and dumbbells in there beside you, weight should not be an issue. Another admirable feature to the Eagle is found in the zippered connections between the wall material and the hardshell fiberglass outer, which make it easy to remove the tent fabric for cleaning or waterproofing. Marketed as a 2/3-person tent, the Roofnest Eagle measures 53 inches wide by 82 inches long. While this would make things incredibly “cozy” for 3 fully grown adults, for two adults and a child it should be just about adequate. While the peak height of 37 inches might seem a little on the low side, one of the most appealing features of the Eagle is that this height is maintained across its 53-inch breadth and entire length, making it far more roomy and livable than standard ground tents with similar or even superior peak heights. When fitted to your car, the Eagle’s fiber-reinforced shell measures 55 inches wide by 85 inches long on the exterior and, because it collapses down to a mere 11.5 inches in height, causes far less drag than many of its competitors—a key consideration for those likely to be travelling long distances and concerned about fuel consumption. In terms of weight, every model of Roofnest tent is tested to hold up to 650 lbs. The upper shell on all models of Roofnest tent is made with ABS-reinforced fiberglass. The sleek, aerodynamic design is not only easy on the eyes but keeps road noise to a minimum and greatly reduces drag compared to many competitor products. The inside of the shell, moreover, is lined with an insulating layer and quilted fabric that combine to make the interior more comfortable and less “boxy” than other models that forego any form of lining or padding on the inner side of the shell. The wall material used in the Roofnest Eagle is a blend of polyurethane-coated polyester and cotton that boasts a very healthy hydrostatic head waterproof rating of 3000mm. The thicker fabric also inspires much more confidence than a traditional ground tent with regard to durability and warmth. The Eagle boasts two large windows with both canvas and mesh zippered closures at the front and rear of the tent. Large doorways on either side of the tent use a mesh screen and zippered closures which can convert into small awnings to provide a bit of shade when the sun’s out. The Eagle comes with a robust, eight-and-a-half foot collapsible ladder that can be attached to the foot of the tent to ensure it stays in place during the night or for added security when entering or exiting the tent. Every Roofnest comes with a very comfortable, built-in 7 cm foam mattress that precludes the need for carrying a sleeping pad and feels more like a real bed than anything we’ve ever slept on in the wild. 3×4’ foot mat to use when getting on and off the ladder. Roofnest provides a two-year warranty against defective workmanship, parts, and materials which fail under normal use, but not due to misuse, neglect, or “acts of God”. One of the factors that sets Roofnest apart from competing brands is its excellent customer service. Even outwith the warranty period on your product, their customer service representatives are very helpful in offering advice on repairs and in sourcing spare parts such as struts, awning poles, and zippers. Shipping costs $249 to anywhere within the lower 48 states and $399 to Alaska or Hawaii. While getting your hands on a Roofnest RTT will set you back considerably more than even the best of traditional tents out there, we can confidently say that every tent in the Roofnest range offers a backcountry sleep set up that is so comfortable, convenient, and hassle-free that it’s worth every single penny.